The new Lichterfelde gas-fired combined heat and power plant was developed in Berlin, Germany. The new CHP plant replaces the existing three-unit Lichterfelde combined-cycle plant. The Doosan Škoda Power steam turbine generates 80MW of electricity. The Lichterfelde gas-fired combined heat and power plant was developed by Vattenfall in Germany to replace the existing power plant, which has been in operation since 1972. Construction of the new plant began in May 2014 and was completed by 2016. It produces around 300MW of electricity and 230MW of heat, which is sufficient energy for approximately 100,000 Lichterfelde homes. The estimated investment on the combined heat and power plant (CHP) is €500m (approximately $648m). The cogeneration plant operates at a fuel-efficiency rate of 85% and offsets 100,000t of CO² emissions a day. The existing Lichterfelde power plant comprises three units, which were converted into natural gas units in 1988, 1991 and 1997. The plant generates 450MW of electricity and 720MW of heat. The new combined cycle power plant was developed at the site as part of the German Government’s integrated energy and climate change programme that aims to increase the amount of power generated by CHP plants from 13% to 25% by 2020, while reducing greenhouse gas emissions. The new Lichterfelde combined-cycle power plant includes a GE 9F gas turbine and a steam turbine from Doosan. The gas-fired plant, operating at a fuel-efficiency rate of 85%, produces 300MW of electricity, including 220MW from the gas turbine and 80MW from the steam turbine. Designed to operate at a frequency of 50Hz, the gas turbine has a net output of 265MW and efficiency rate of 37.8%. The turbine incorporates a Dry Low NOx combustion system, which enhances the fuel staging capability and enables turndown load to 32% of the base load. The 9F gas turbine is known to have the lowest lifecycle cost in its class and comprises an extended 32,000 hour-combustion and a four-stage hot-gas path design. Differential heat outputs are generated using hot water generators with a thermal input of 135MW. The new plant is equipped with an integrated power and automation system provided by ABB to optimise power and heat generation, as well as minimise greenhouse emissions. The solution, based on ABB’s Symphony Plus total plant automation system, enables the plant to efficiently produce energy, while adapting to the changes demanded by the local power distribution and district heating networks. The flexible and scalable configuration of the Symphony Plus automation system helps to create better operations in small and server-less architecture, as well as in large multi-server architectures. For improved plant control, the system integrates all the process and turbine automation systems, electrical and supervisory control and data acquisition (SCADA) solutions. The electrical components of the system include step-up transformers, generator circuit breakers, power protection equipment, switchgear and auxiliaries. Iberdrola Engineering was awarded the engineering, procurement and construction (EPC) contract for the Lichterfelde power plant in March 2013. The contract for the supply, operations and maintenance of the gas turbine was awarded to GE. ABB was contracted to provide the power and automation solution. The scope of the contract also included the supply of the electrical balance of plant and mechanical systems, including the pressure reduction station, gas compressor, fire protection and the compressed air system. Flowserve supplied pumping systems for the plant, while Doosan Škoda Power is the supplier of the steam turbine, as well as other equipment such as generator, condenser and industrial heating burners. 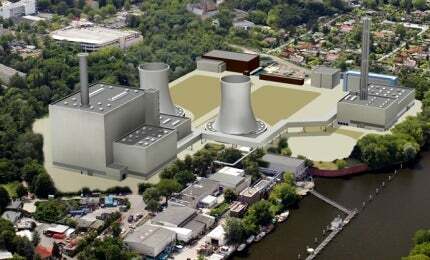 VPC provided general planning services for the power plant.